Carl Bell (sports columnist), Northwest Arkansas Times, January 26, 1942, p. 6. "Trader" Hawn [should] stay with baseball -- because he is to baseball, as far as Fayetteville history is concerned, a lot like W.J. Lemke is to journalism in Arkansas…The good ones never quit. Alan Gilbert. Our Town (column): An Angel Revisited. Northwest Arkansas Times, July 8, 1972, p. 3. If you were a young baseball player in Arkansas, Missouri, or Oklahoma during the 1950s and 1960s, and if you had a modicum of talent as a pitcher or hitter, you hoped that a man named Fred Hawn would show up to watch you pitch a no hitter or hit four home runs or, preferably, both. Perhaps after such a game, you thought, Hawn would pull a contract and a bonus check from his pocket and you would be headed to play for the St. Louis Cardinals. Hawn could do that because he was a Cardinals’ scout. He signed such major leaguers as Lindy and Von McDaniel from nearby Oklahoma, Jim King from Elkins, the Smith brothers from Barling, and Wally Moon. Maybe, young players thought, we could be next. Hawn, a long-time and well-known Fayetteville resident, had become a Cardinal scout in about 1946, and he continued in that position until 1972. Before that, the Huntsville native had been a local luminary as a player for and manager of Fayetteville’s first professional baseball team. His pro career began in 1929, when Hawn was 22, as a catcher for the Muskogee/Maud Chiefs, a team in the Class C Western Association. Hawn, playing at 5’ 8”, 165 pounds, he did not take pro ball by storm, although he hit a respectable .261 his first year. He came back to play for the Muskogee Chiefs in 1930, hitting only .239 in 79 games. 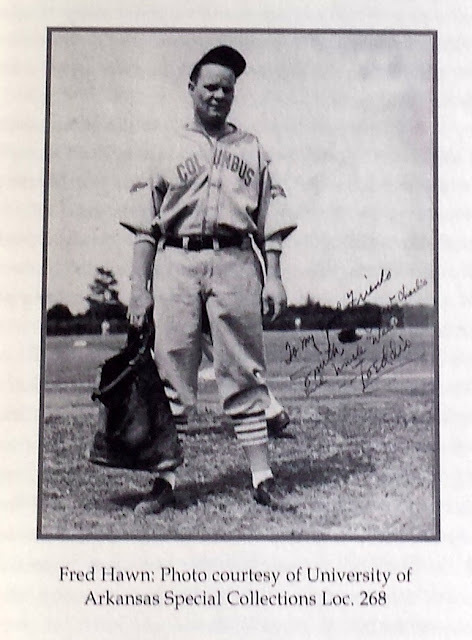 That batting average was not good enough to get him on a professional team in 1931, but he returned briefly to pro ball in 1932 to play for the Ft. Smith Twins/Muscogee Chiefs, appearing in only 15 games. In 1933, he again did not play on a professional team. Some 27-year-old players might have given up on professional baseball after they had played only 15 games on pro teams in three years. Not Fred Hawn. He got back into pro ball in 1934 by helping create the Arkansas State League (Class D) and co-owning one of its teams, the Fayetteville Educators. Hawn was not only the team owner, he also organized and managed it, and was the team’s starting catcher. Fayetteville Bears, likely 1936. Hawn has his hands on his hips on the back row. As he played for and managed the Fayetteville team in 1934, 1936 and part of 1937, Hawn became a well-known, popular figure in the city. His fame was assisted by a talented young reporter for the local paper, W.J. Lemke, who loved baseball and wrote colorful stories about the local team and others in the league. Lemke had high regard for Hawn and was amused by him. Lemke tagged him with several nicknames, such as “Old Timer,” based on Hawn’s advanced age in a league full of younger players. 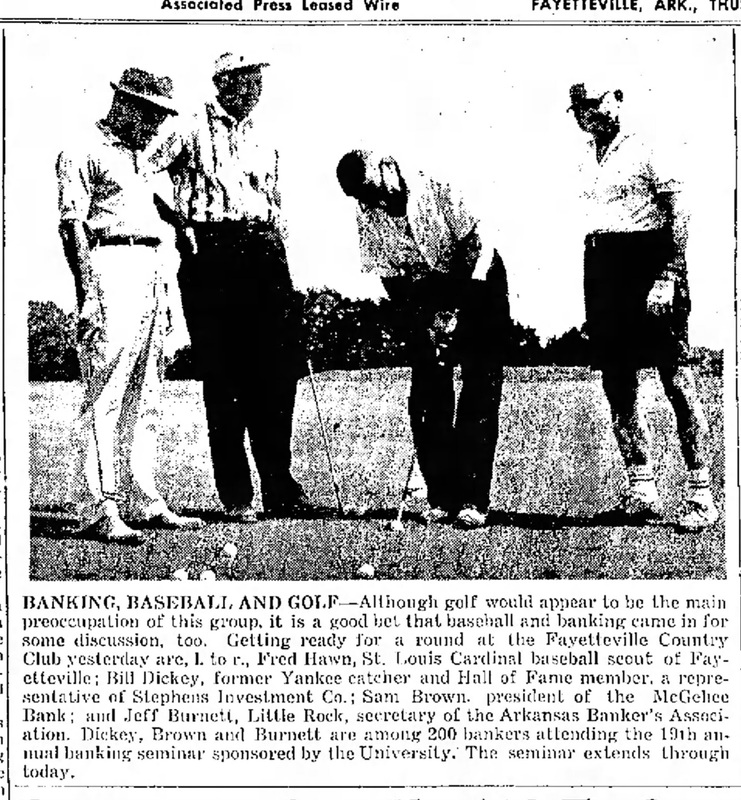 Hawn’s connection with the St. Louis Cardinals’ organization, for whom he would work for more than 35 years, likely started in 1936 when – after a year out of pro baseball -- he managed and played for the Fayetteville team. The team was affiliated with the Cedar Rapids minor league team, a St. Louis Cardinal Class A farm club. In 1937, Hawn returned to the Fayetteville Angels as manager-player, but in July he was sent to manage the New Iberia (Louisiana) Cardinals, another of St. Louis’ Class D teams. In 1938, Hawn did not manage a team, but had some new experiences: he assisted with the Cardinal’s spring training camp in Florida, then worked as a coach with the Columbus Red Birds, the Cardinal’s AA farm team, its highest level farm team at the time. Hawn returned in 1939 to the Arkansas-Missouri League to manage and play for the Monet Cardinals. After that, he continued to manage Cardinal farm teams in 1940 and 1941. Hawn spent 1942, 1943, and 1944 in the Army Air Force (AAF), mostly playing and coaching baseball at the AAF’s Virginia Beach facility. Back in civilian life in 1945, he was player/manager for the Johnson City (Tennessee) Cardinals. Following that experience, he gave up managing and playing to become a full-time scout for the Cardinal team. Based in Fayetteville, he evaluated talent in Arkansas, Missouri, and Oklahoma. When he retired in 1972, it was clear that “Fayetteville Freddie” had been able to parlay some modest athletic talent, grit, and an out-sized personality into local fame and a long career in professional baseball. No blame is attached by relatives of the unfortunate lad. The trigger apparently was touched accidentally when the Hawn Lad gave the command “halt” and the Nunnally (sic?) boy lowered the gun from his shoulder to the ground. It was not known that the weapon was loaded. Both children had the desire to become soldiers and they drilled frequently. In the years that followed, Fred Hawn’s name appeared in the local paper on a few occasions in conjunction with sports. In 1920, a newspaper story reported that the Fayetteville Tigers were going to play the Springdale “Scrubs” in football. The Fayetteville team was made up of high school freshmen and some grammar school boys. The starters included Fred Hawn at the quarterback position and “Lowry Nunnely”(sic?) -- the boy who had accidentally shot his brother -- as a halfback. A couple of days later, a story in the local paper described the efforts of Lowry Nunnelly to help create a football conference in Northwest Arkansas in which Fayetteville High School would compete. Nunnelly was the team’s captain and Fred Hawn was listed as a candidate to play tackle for the FHS team. A newspaper article in 1923 declared that the University High School baseball team was the champion of Northwest Arkansas. The team’s catcher was 16-year-old Fred Hawn, whose batting average was .363. It must have been some team: Hawn’s batting average was only the 7th best of the starters. I have no information about Hawn’s life from 1924 to 1928. I would guess that he was playing semi-pro baseball during these years, perhaps with a full-time job to support him. He shows up in the records of professional baseball as playing baseball in 1929 for a team in the Western Association, Class C ball, the Muskogee/Maud Chiefs. Hawn had a good year at the plate, hitting .261 in 68 games (see table 1). His defensive play as a catcher was not as good, with 36 errors and the team’s lowest fielding percentage. In 1930, he was again on the Muskogee Chiefs/Springfield Midgets team, hitting .239 in 79 games. His fielding improved, with only 15 errors in the 68 games he caught. Perhaps because of his low batting average the previous year, Hawn was out of professional ball in 1931, but returned 1932, playing only 15 games and hitting a lowly .111 for the Fort Smith Twins/Muscogee Chiefs. He was again out of professional baseball in 1933. The following tables show the teams for which Hawn played and/or managed during his career and his batting statistics for each year he played. After playing only 15 games of professional baseball over three seasons, Hawn’s future in pro ball was not bright; however, he found a way in 1934 to get back into the game: he helped to create a new Class D league, the Arkansas State League, in which he co-owned the Fayetteville team. During the first season of the League, it was comprised of the Bentonville Officeholders, the Siloam Springs Buffalos, Rogers Rustlers, and the Fayetteville Educators. In the years that followed, some teams left the league and others joined it. In 1936, the league was renamed the Arkansas-Missouri League because Cassville and Monett, both cities in Missouri, had teams in the league.. According to W. J. Lemke, Hawn was a “moving spirit behind the organization” of the league. At a meeting on March 1, 1934 to organize the league, he and V. James Ptak, who was for many years a judge in Fayetteville, represented the city. Hawn led the effort to create a team in Fayetteville that would be part of the new league. He not only was an owner of the new Fayetteville team, he recruited and selected the players for the team, managed it, and usually was its starting catcher. 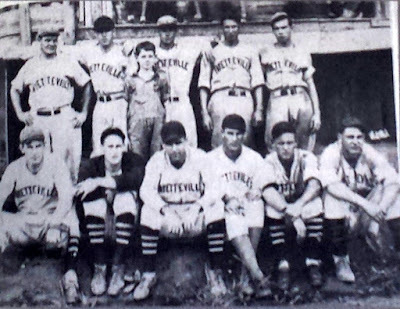 Thanks in large part to his efforts, the Fayetteville Educators --the city’s first professional baseball team – played its first game on May 8, 1934. The team did not do well in the standings and Hawn had a mediocre year as a player, hitting only .224. Even worse for him, the team’s revenues were not sufficient to cover its expenses. The revenues came mostly from the admission charge, 25 cents for adults and 10 cents for children; from the beginning, attendance was often low. It declined further after the team’s Fairgrounds Park lost some of its best seats when on June 16, the roof over them collapsed during a wind storm. The team’s expenses included salaries of $30 to $50 salaries for each of the teams 14 or so players, payment of league expenses (e.g. for umpires and dues to a national organization of professional teams), and the cost of transportation and baseballs (two new balls per game, 80 cents each). Throughout the first year, teams in the league were often on the brink of financial disaster. This whole matter was so distressing and stressful for Hawn that he took off a few days from the team and gave up his position as manager. After missing a few games, he returned as a player, but the season ended early, soon after his return, because of the league’s financial problems. After the 1934 financial failure, the ownership of the Fayetteville team was assumed by a group of local businessmen, and its finances were somewhat more solid with their backing and some modest assistance from the St. Louis Cardinals’ organization. Perhaps because of the financial fiasco, Hawn was not on the Fayetteville team (renamed the Bears) during most of the 1935 season, but returned as the season was ending to play in nine games. The following year, 1936, Hawn was again hired to manage the Fayetteville team, likely, at least in part, due to a campaign on his behalf waged by Al Williams, a sports writer for the Fayetteville Daily Democrat. On March 2, 1936, the paper announced that the “antediluvian” Hawn, the “ancient mariner,” had been named to manage the team. Hawn was 29 years old at the time. During the 1936 season, Hawn played the best baseball of his career. In 101 games, his batting average was .287, well above his lifetime average of .234. At one point in the season, he had a nineteen-game hitting streak. To celebrate his role with the team, “Fred Hawn Day” was held on September 3, 1936 at the Washington County Fair Grounds at a Fayetteville Bears game, and Hawn was given a shotgun as a gift, paid for by contributions from fans. That day, he was injured by a foul tip off one of his fingers and had to leave the game and miss the rest of the season. Hawn returned in 1937 to manage and play for the Fayetteville team, whose name had been changed to Fayetteville Angels. As in 1936, the Fayetteville team was a St. Louis Cardinal farm club (through its affiliation with the Cedar Rapids minor league team) and in the middle of the season, Hawn was promoted to manage another of St. Louis’s minor league teams, the New Iberia (Louisiana) Cardinals, in the Evangeline League. This team was a direct affiliate of the St. Louis Cardinals. 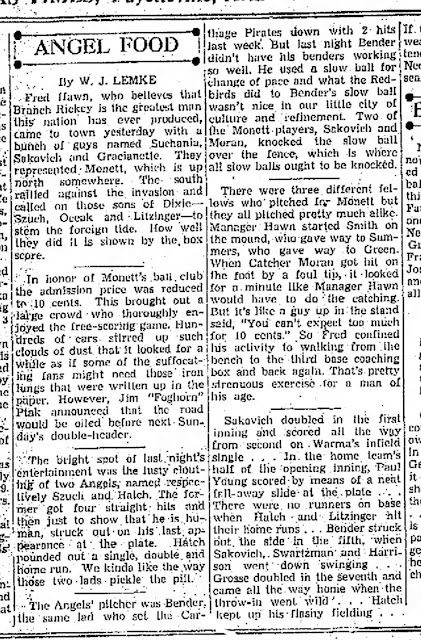 Hawn got caught up in a controversy that arose because the St. Louis Cardinals in 1937, contrary to rules set by the baseball commissioner, Judge Kenesaw Mountain Landis, operated two farm clubs in the Arkansas-Missouri League: Monett and Fayetteville. The perpetually frowning Landis had decreed that major league teams could have only one team per minor league organization, and he held a hearing in March 1938 to investigate St. Louis’s transgressions. He summoned Hawn to testify at the hearing. When asked what he had said in his testimony, he replied: “Well…I was so nervous that the first thing I knew I was telling him the truth.”  Apparently his testimony did not upset the Cardinals too much because he continued to work for its organization. Hawn played in 81 games in 1939, but hit only .177 for Monett. He also pitched in 6 games for the team, a total of 21 innings in which he gave up 20 hits and 7 earned runs. His ERA was a respectable 3.00. The Monett team had a disastrous record, winning only 35 games while losing 89. The following year, 1940, when the Arkansas-Missouri League had to shut down because of failing finances, Hawn was managing the Cooleemee Cards in the North Carolina State League. Much of the local communities’ interest in Ark-Mo baseball was due to the personalities of the team managers. Fred Hawn, a home-town boy who managed the Educations-Bears-Angels for four seasons [sic] had a big following. He supplied some good baseball plus a lot of entertainment. Lemke told several stories about Hawn and his time in the Arkansas-Missouri League. According to Lemke, Hawn did not get off to a fast start in 1934, the first year of the Arkansas State League and did not get a hit for week. When he did get his first hit, “he knelt down and kissed first base.” Another account of the incident, cited by Hogan, was in the local newspaper, which reported that Hawn not only kissed the base, but also shook the hand of the first baseman. 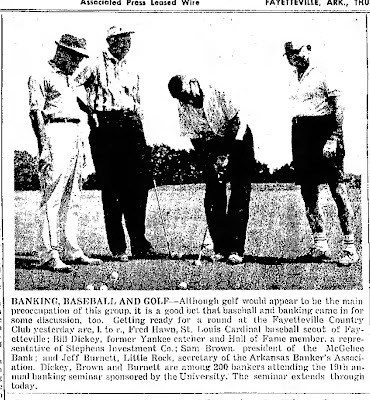 When Hawn managed the Fayetteville team in 1936, he must have impressed the St. Louis Cardinal organization, which had pioneered the use of “farm clubs” in the minor leagues to help prepare its players for the major leagues. In 1937, Hawn was clearly affiliated with, though likely not yet an employee of, the Cardinals. As mentioned earlier, that year he was promoted midseason from the Monett Cardinals to manage another Cardinals’ farm team. In 1938, Hawn had an unusual year, one that likely solidified his role with the Cardinals. After marrying Maud Gold in Fayetteville on February 8, the couple went to Florida where Hawn assisted the Cardinal’s training school in Winter Haven. When the season started, Hawn was on the coaching staff of the AA Columbus Red Birds, the Cardinal’s highest ranked farm team. As described earlier, Hawn returned to the Arkansas-Missouri League in 1939 to manage the Monett Cards, then in 1940, he was sent to manage the Cooleemee Cards, another St. Louis Cardinal’s class D farm team, in the North Carolina State League. He also played in 19 games there, hitting .111. In late-March, 1941, Hawn headed to Albany Georgia to instruct pitchers in the Cardinal organization for two weeks; then he did the same thing for two weeks at Columbus, Georgia. After that, he went to North Carolina to again manage the Cooleemee Cards. Branch Rickey engineered a switch of managers sending [Charlie] Martin to Cooleemee, North Carolina, and bringing Fred Hawn to the [Union City] Greyhounds. He said it should put new life into both teams. For a while he was right. Hawn interrupted his baseball carrier in 1942, when at the age of 35 he joined the Army Air force (AAF). As an enlisted man in the AAF, he made good use of his baseball knowledge. He was stationed at the AAF’s “redistribution center” in Atlantic City. According to a newspaper story in the Binghamton (NY) Press, the center operated an extensive sports program for pilots who had completed their tours on the war fronts. As they were awaiting reassignment, they came to the facility at Atlantic City to relax and recuperate. While there, they had their choice of 22 different sports, including baseball, in which they could take part. The story noted that Sgt. Fred Hawn was in charge of baseball and was also the catcher and one of the leading hitters on the station team. Hawn became a full-time scout in the latter part of 1945 or in 1946 after he finished managing the Johnson City team. The 1947 Baseball Guide and Record Book, compiled by J.G. 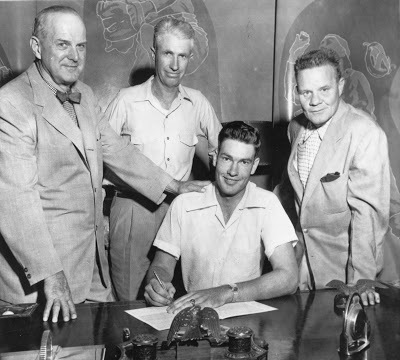 Taylor Spink, lists Hawn as scout for the St. Louis Cardinals. During Hawn’s years of scouting, the job required judgement and wisdom unaided by tools such as “guns” to measure how fast a ball was thrown. A scout might occasionally use a stop watch to measure speed, but mostly formed his impressions of reflexes, hitting and fielding ability, savvy, speed, and other factors by watching players play. To find talented country players that might otherwise be difficult to identify, scouts would invite players to attend tryout camps they would operate at different locations. There, they could watch players display their abilities. Also, they would attend special baseball instructional schools, such as the one conducted in 1948 by Rogers Hornsby in Hot Springs. These camps and schools sometime uncovered players that made it to the major leagues. Much of a scout’s time from early spring through December was spent watching prospects play baseball. Hawn would get tips about players from a network of “birddogs,” coaches, friends, and acquaintances who loved baseball and the St. Louis Cardinals. He traveled extensively around his territory, checking out players who might make the grade. Of course, a scout’s job was not only to identify top prospects, but also to sign them before another team got their signature on a contract. Thus, Hawn had to build relationships with young prospects and, often, with their parents, preferably starting when the player was still in high school. A good example of Hawn’s ability to build such relationships can be seen in the story of the signing of Lindy McDaniel, who grew up on a farm in rural Oklahoma. He was most successful major league player that Hawn signed. During the period between 1953 and early 1955, we had several visits from Fred Hawn the Cardinals’ scout in the Oklahoma-Arkansas area. Fred is one of the most honest men I’ve ever met and he’s practically become one of our family. After Lindy had outgrown American Legion competition, Fred arranged for him to play in an industrial league in Oklahoma City and later for team in Bentonville, Arkansas. It was good experience for Lindy and yet he remained eligible to play baseball and basketball at college. When Lindy came home from school in the spring of ’55, Fred offered him a job at an oil company in Sinton, Texas, where he could play with the company’s traditionally powerful team in the National Baseball Congress (N.B.C.) competition. The salary was good and Lindy pounced on the offer. By August, Lindy’s pitching had helped the team reach the N.B.C. playoffs. I was making plans to take the family to one of the games when a call from Lindy upset the calm. Quickly I called Fred Hawn. Let’s go down to Sinton,” he said. At Sinton, Fred watched Lindy thrown for 15 minutes before a game. When the boy finished, Fred turned to me. “I’m ready to take him to St. Louis,” he told me. The next morning, Fred Hawn almost broke down our door. His beaming face told use the news. The Cardinals had decided Lindy was worth $50,000 – the biggest bonus they had every paid any boy. This story shows some of the mechanics involved in getting the signature of a big-time pitcher on a Cardinals’ contract. After building a relationship over several years, Hawn was able to steer Lindy McDaniel to the Cardinals when he was ready to play in the Big Leagues. Hawn must have been a good scout because he kept his job until he reached retirement age in 1972. As part of his retirement, he was honored with a special night at the Tulsa 0iler baseball park on August 26. (Tulsa was the nearest St. Louis farm club to Fayetteville.) According to the Fayetteville paper, 30 or more couples traveled from Fayetteville to take part in the night honoring him. .
Perhaps Fayetteville Freddie was nudged into retirement a bit before he wanted. In an article about his retirement, he indicated that he might take a job scouting for another team. Apparently, he did not. However, I doubt that he ever quit keeping an eye out for baseball talent that might be of value to his Cardinals. August 23, 1962, p. 1. Hawn apparently enjoyed golf and in retirement was often at the Fayetteville Country Club. My friend and fellow baseball player in the early 1960s, Bubba McCord, says he often saw him there. The retired scout had an embarrassing and regrettable incident in 1975 that made the newspapers, but I will omit that story. Instead I prefer to look back at the career of Fayetteville Freddie and admire all that he accomplished during his life in baseball through his grit, hard work, and personality. He was a person that Fayetteville could proudly claim as its own. Fayetteville Daily Democrat, May 23, 1916, p4. The newspaper story spelled the boy’s last name two different ways: Nunnally and Nunnely. Other articles in the newspaper in following years usually spelled his name as Nunnelly. I believe that Nunnelly is the correct spelling. “Jack Hawn Accidentally Killed by Playmate.” Fayetteville Democrat, July 15, 1918, p 1. “Tigers to Meet Springdale Scrubs.” Fayetteville Daily Democrat, Nov. 5, 1920. “10-Bouts Staged as Playground Benefit; About $100 Cleared.” Fayetteville Daily Democrat, September 8, 1921, p. 1. “New High School Team Expect to be Winner.” Fayetteville Daily Democrat, Sept 10, 1921 p. 1. 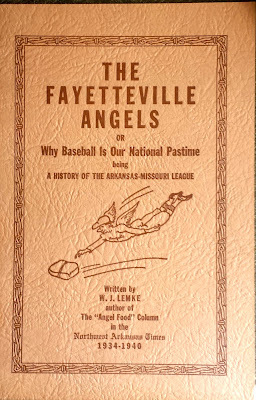 The story of the Fayetteville Educators/Bears/Angels and the Arkansas-Missouri League has been told well by two writers. First, W.J. Lemke covered the team and the league throughout their history as a reporter for the Fayetteville paper. He clearly enjoyed baseball and had an eye for colorful characters and amusing anecdotes that made for lively and often humorous reading. 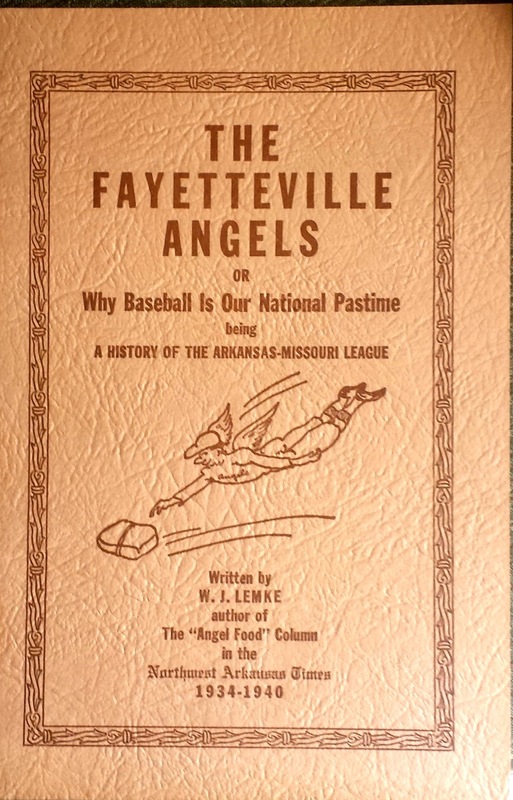 A dozen years after the closing of the league, he wrote a short history of it, titled The Fayetteville Angels or Why Baseball is Our National Pastime being A History of the Arkansas-Missouri League (1952?). This booklet has no publication date (e.g., year of publication) and is not paginated. More recently, a detailed, well-researched history of the Fayetteville Educators/Bears/Angels was published in a book, Angels in the Ozarks by J.R. Hogan [Pen-L Publishing, 2013]. 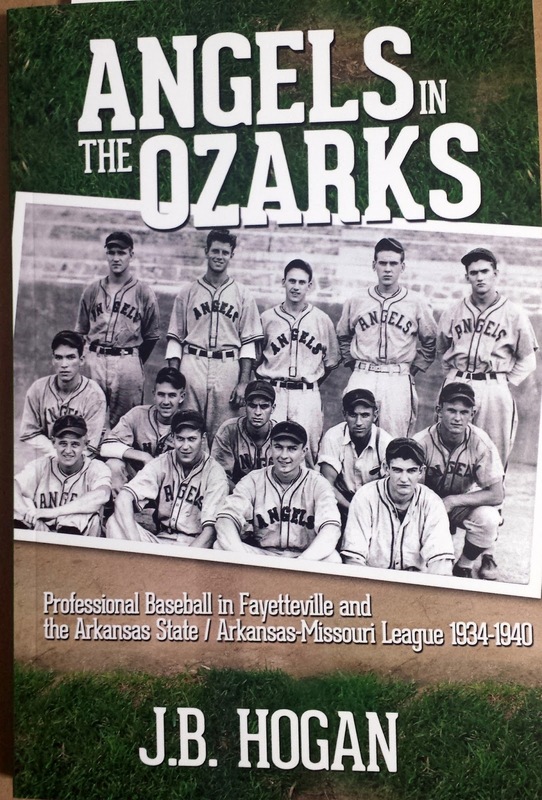 Hogan not only provides a season-by-season account of the league and the Fayetteville team, but also appends about 60 page of rosters, player accomplishments, and statistics covering the entire history of the league. The book recounts many of the interesting stories about the players and teams, and it gives accounts of key games played each year. These two books are the sources of most of what I write about Hawn’s years in the Arkansas State/Arkansas-Missouri League. They are supplemented by information from some newspaper articles located through Newspapers.com. According to Lemke, “On June 16, a windstorm unroofed the central part of the grandstand, so that for the remainder of that season the fans had to sit at the north and south ends of the stand, leaving the gaping center section empty.”[Lemke, 1952, n.p.] Also see Carl Kay Bell. On the 50-Yard Line (column), Northwest Arkansas Times, March 27, 1941, p. 4. Carl Kay Bell. On the 50-Yard Line (column), Northwest Arkansas Times, March 27, 1941, p. 4. Quoted in Lemke, 1952, n.p. W.J. Lemke. “Angel Food” (column). Northwest Arkansas Times, May 4, 1939, p. 4. W.J. Lemke. “Angel Food” (column), Northwest Arkansas Times, May 5, 1939, p. 8. Lemke quotes are from Lemke, 1952, unless a newspaper source is cited. Hogan, 2013, footnote 9, p. 166. W.J. Lemke. “Angel Food” (column). Northwest Arkansas Times, May 29, 1939, p. 6. Gold had graduated from the University of Arkansas and was on the staff of the local paper, whose name had been recently changed from the Fayetteville Daily Democrat to the Northwest Arkansas Times (NWAT). “Hawn-Gold Wedding on February 8 Announced Today.” Northwest Arkansas Times, March 23, 1938, p. 3. A brief article in the Northwest Arkansas Times in September 1938 stated that Fred Hawn had returned to Fayetteville after coaching the Columbus teams. “Fred Hawn Returns to Fayetteville,” Northwest Arkansas Times, Sept. 13, 1938, p.5. It is not clear what Hawn he did in the off season, but a 1939 article in the Fayetteville paper listed him as a referee for a University of Arkansas basketball game. “Arkansas Quint Plays Clothiers Here Tonight.” Northwest Arkansas Times, Feb. 18, 1939, p. 6. Carl Kay Bell. “On the 50-Yard Line” (column), Northwest Arkansas Times, March 27, 1941, p. 4. 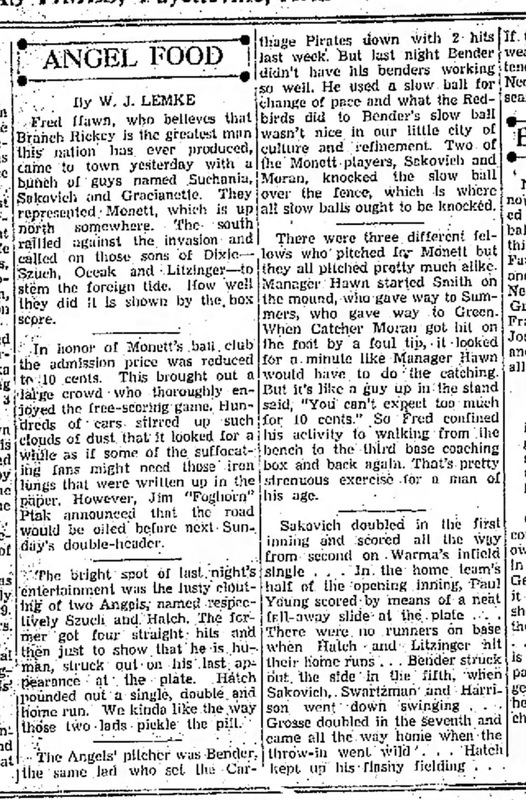 “Atlantic City Sports Haven Provided Returning Airmen.” Binghamton (NY) Press, July 27, 1944, p. 22. A shorter version was published in the local paper. “Sgt. Hawn Instructs Men Back From Fronts.” Northwest Arkansas Times, June 14, 1955, p. 6. For example, see “Cards’ Tryout Camp in Council Bluff,” The Daily Iowan, August 27, 1947, p. 2 and see the notice about Hornsby camp in the Northwest Arkansas Times, Feb. 18, 1948, p. 3. “Recruiter for 24 Years, Fred Hawn Looks for Talent,” Northwest Arkansas Times, April 3, 1967, p. 16 and “Hawn Eyes Another Smith.” Northwest Arkansas Times, July 11, 1961, p. 12. [After I got an offer from a Philadelphia scout] I called my dad and told him what the man had said. 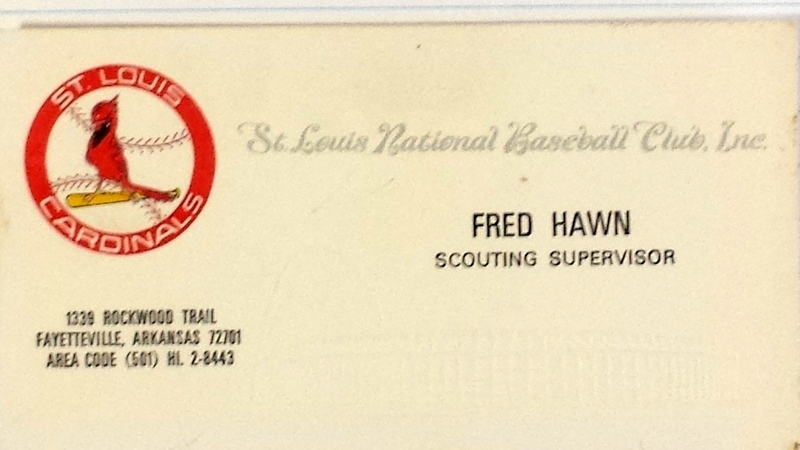 Dad immediately called Fred Hawn, a Cardinal scout who had been closely following my development. Fred lived in Fayetteville, Arkansas. He got excited and hopped in his Cardinal Red Ford Thunderbird convertible and rushed to Hollis, Oklahoma to pick up my dad. Then both of them came to Sinton, Texas to see what was going on. Fantastic biography. Thanks for putting this together. Do you perhaps know where Hawn was buried after he passed? Thank you. Also many thanks for the hard work you devote to ArkBaseball.com, a great and interesting resource. At one point in my research on Hawn, I ran across information about the cemetery in which Fred Hawn is buried. Unfortunately, I cannot find that information in my notes. I will keep looking, and if I run across it I will note it in a comment. I was fortunate enough to be signed by Freddie. He took me, Junior Smith, and Tommy Neal to Tulsa to tryout. He was all class. Steve, I did not know that Fred Hawn signed you. It must have been near the end of his career as a scout. I'm sure the tryout was an exciting experience. Obvious, based on the results, it went well. Bubba McCord and I once helped a scout conduct a tryout session with Justin Daniels at the old Fairgrounds Park. When I was pitching to Justin I couldn't decide whether I should be trying to strike him out or to help him hit. Of course it didn't make any difference: he could hit me whether or not I was trying to strike him out. Hope you are doing well.